8. LOROSTEMON Ducke, Arq. Inst. Biol. Veg. 1: 210. 1935. Trees, latex white to yellow. Leaves opposite, with conspicuous subparallel secondary veins, with latex canals. Flowers solitary, terminal, bisexual, with several pairs of basal bracts. Sepals 5, imbricate; petals 5, elongate and linear. Stamens many; filaments fused basally into 5 fascicles; anthers long. Ovary elongate, 5-locular; ovules few per carpel; style short; stigma ± lobed. Fruit stipitate, dry, indehiscent or dehiscing by twisting of the valves. Seeds large; cotyledons minute. Colombia, Venezuela, Guyana, Peru, Brazil; ca. 4 species, 1 in Venezuela. 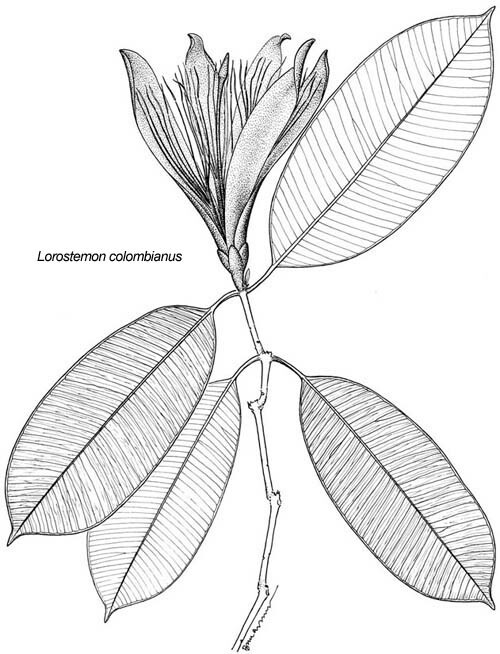 Lorostemon colombianus Maguire, Bot. Mus. Leaf. 18: 159, t. 30. 1958. Small tree 10-15 m tall; latex yellow; petals deep red. Lower montane forests, 700-800 m; Amazonas (Sierra de la Neblina along Brazilian border). Colombia, Peru, Brazil. Fig. 216. Paul Berry (peberry@facstaff.wisc.edu) or Kay Yatskievych (kay.yatskievych@mobot.org).